Update 2009-10-14: The author of the program announced that the app is permanently shut down because of lack of resources to maintain it. They have published the source though. Get it while it's still up! 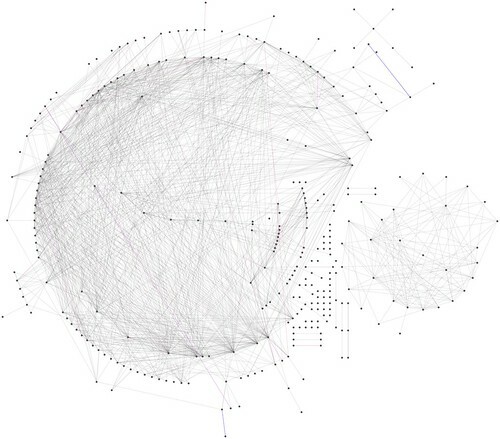 I revisited Nexus a week ago to check out how my Facebook network's topology has become now that I have made some new friends in the art and music scene. The interactive application is useful, but what interests me most is the forming of different clusters. Unfortunately, Nexus does not yet intelligently group these for you, so I took a screenshot of the result and did some visual mapping of the underlying cluster on Inkscape. + Family and friends of family. + Sexual orientation: gay aka extended family. + Education: high school, college. + Professional: co-workers, clients, industry events. + Interests: art, music, photography. + Random: by chance meetings, dates, social networks like Flickr and Twitter. 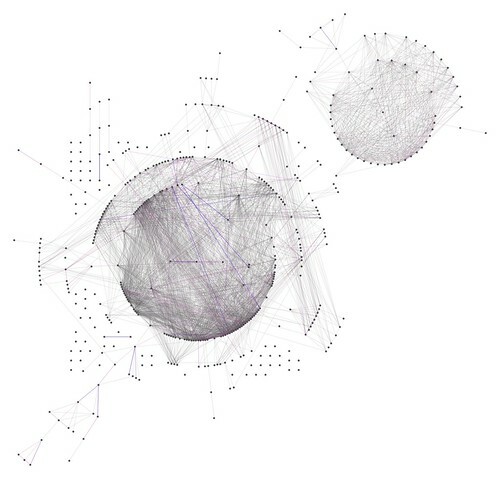 What is important to note in this diagram is that it reveals the interconnectedness of relationships between your contacts. Since I have spent a large part of my adult life working in interactive media in New York, most people that I know which forms the core of the diagram lies in the center of the graph. There is a separate cluster (green) which is fairly separate from the rest, from the network of friends living in Hong Kong. There are interesting links moving from the interactive design world with the art and music world because it is not difficult to imagine the interconnectedness of the creative world. Some nodes do not connect with anyone else because I met them via social networks like Flickr and Twitter. These are folks I would not have met if not for those networks, so it is not hard to imagine that they likely would not have come in contact with the rest of my network universe either. One feature that would have been nice is to see a time-lapse display of the graph changing over time. 2008-03-04: I just joined Facebook not too long before this so the hubs are mostly co-worker, but you will notice some fairly unconnected nodes, again, mostly from either being gay or people I met on Flickr. Created using Nexus with Facebook relationship data of See-ming Lee on 2009-09-01. Nexus is a Facbook network visualizer and can be found at nexus.ludios.net. Cluster mapping and infographics created using Inkscape. I just recently discovered your Blog and appreciate you sharing your bout with Facebook Application with the world. but this site also search best knowledge Facebook Application.